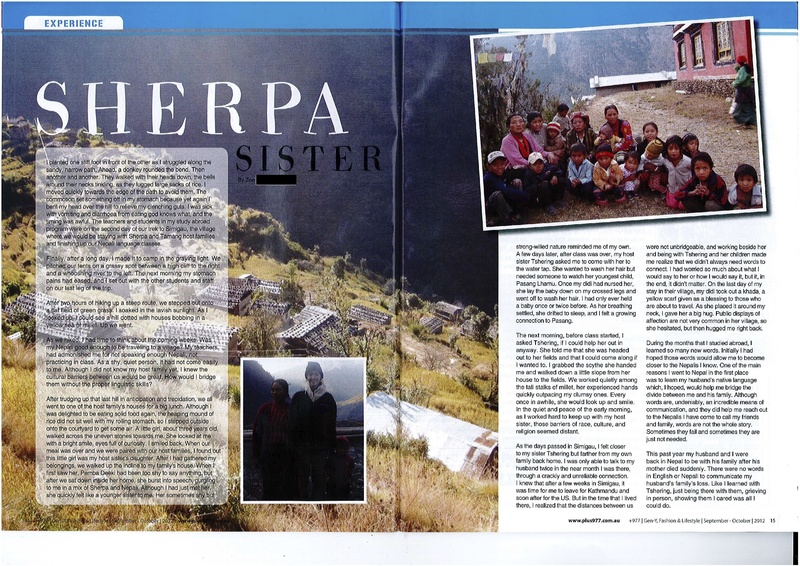 A while back, M from nepaliaustralian asked if I would like to submit a story to the Nepali magazine she writes for in Australia, and they published it in the Sept-Oct issue. I’ve mentioned my Sherpa host family a few times on this blog, but I never really wrote about the experience in detail, so for the article, I wanted to write a little more about it and the impact it had on me. Here is what the story looks like in the magazine.. I planted one stiff foot in front of the other as I struggled along the sandy, narrow path. Ahead, a donkey rounded the bend. Then another and another. They walked with their heads down, the bells around their necks tinkling, as they lugged large sacks of rice. I moved quickly towards the edge of the path to avoid them. The commotion set something off in my stomach because yet again I bent my head over the hill to relieve my clenching guts. I was sick with vomiting and diarrhea from eating god knows what, and the timing was awful. The teachers and students in my study abroad program were on the second day of our trek to SG, the village where we’d be staying with Sherpa and Tamang host families and finishing up our Nepali language classes. Finally, after a long day, I made it to camp in the graying light. We pitched our tents on a grassy spot between a high cliff to the right and a whooshing river to the left. The next morning my stomach pains had eased, and I set out with the other students and staff on our last leg of the trip. After two hours of hiking up a steep route, we stepped out onto a flat field of green grass. I soaked in the lavish sunlight. As I looked up, I could see a hill dotted with houses bobbing in a yellow sea of millet. Up we went. As we hiked, I had time to think about the coming weeks. Was my Nepali good enough to be traveling to a village? My teachers had admonished me for not speaking enough Nepali, not practicing in class. As a shy, quiet person, it hadn’t come easily to me. Although I didn’t know my host family yet, I knew the cultural barriers between us would be great. How would I bridge them without the proper linguistic skills? After trudging up that last hill in anticipation and trepidation, we all went to one of the host family’s houses for a big lunch. Although I was delighted to be eating solid food again, the heaping mound of rice didn’t sit well with my roiling stomach, so I stepped outside onto the courtyard to get some air. A little girl, about three years old, walked across the uneven stones towards me. She looked at me with a bright smile, eyes full of curiosity. I smiled back. When our meal was over and we were paired with our host families, I found out this little girl was my host sister’s daughter. After I had gathered my belongings, we walked up the incline to my family’s house. When I first saw her, PD had been too shy to say anything, but after we sat down inside her home, she burst into speech, gurgling to me in a mix of Sherpa and Nepali. Although I had just met her, she quickly felt like a younger sister to me. 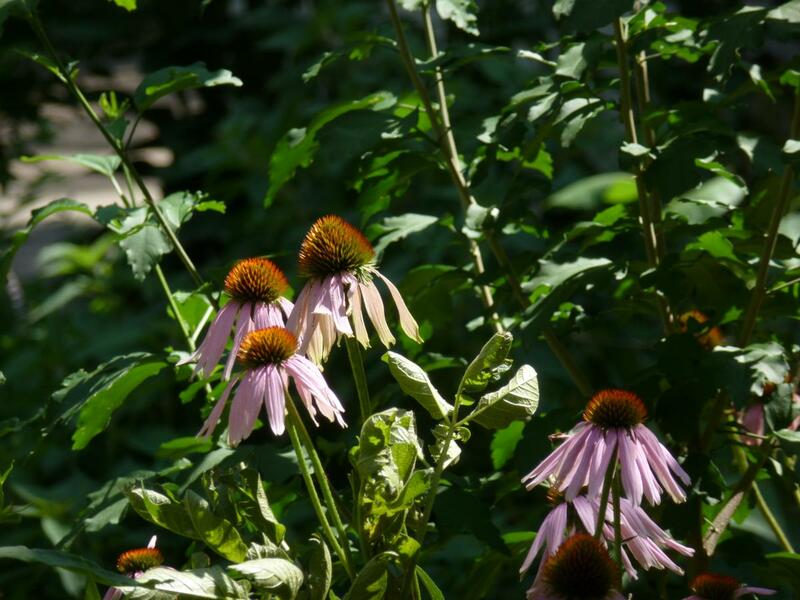 Her sometimes shy but strong-willed nature reminded me of my own. A few days later, after class was over, my host sister, TS, asked me to come with her to the water tap. She wanted to wash her hair but needed someone to watch her youngest child, PL. Once my didi had nursed her, she lay the baby down on my crossed legs and went off to wash her hair. I had only ever held a baby once or twice before. As her breathing settled, she drifted to sleep, and I felt a growing connection to PL. The next morning, before class started, I asked TS if I could help her out in anyway. She told me that she was headed out to her fields and that I could come along if I wanted to. I grabbed the scythe she handed me and walked down a little slope from her house to the fields. We worked quietly among the tall stalks of millet, her experienced hands quickly outpacing my clumsy ones. Every once in awhile, she would look up and smile. In the quiet and peace of the early morning, as I worked hard to keep up with my host sister, those barriers of race, culture, and religion seemed distant. As the days passed in SG, I felt closer to my sister TS but farther from my own family back home. I was only able to talk to my husband twice in the near month I was there, through a crackly and unreliable connection. I knew that after a few weeks in SG, it was time for me to leave for Kathmandu and soon after for the US. But in the time that I lived there, I realized that the distances between us weren’t unbridgeable, and working beside her and being with T and her children made me realize that we didn’t always need words to connect. I had worried so much about what I would say to her or how I would say it, but it, in the end, it didn’t matter. On the last day of my stay in their village, my didi took out a khada, a yellow scarf given as a blessing to those who are about to travel. As she placed it around my neck, I gave her a big hug. Public displays of affection aren’t very common in her village, so she hesitated, but then hugged me right back. During the months that I studied abroad, I learned so many new words. Initially I had hoped those words would allow me to become closer to the Nepalis I know. One of the main reasons I went to Nepal in the first place was to learn my husband’s native language which, I hoped, would help me bridge the divide between me and his family. Although words are, undeniably, an incredible means of communication, and they did help me reach out to the Nepalis I’ve come to call my friends and family, words aren’t the whole story. Sometimes they fail and sometimes they’re just not needed. 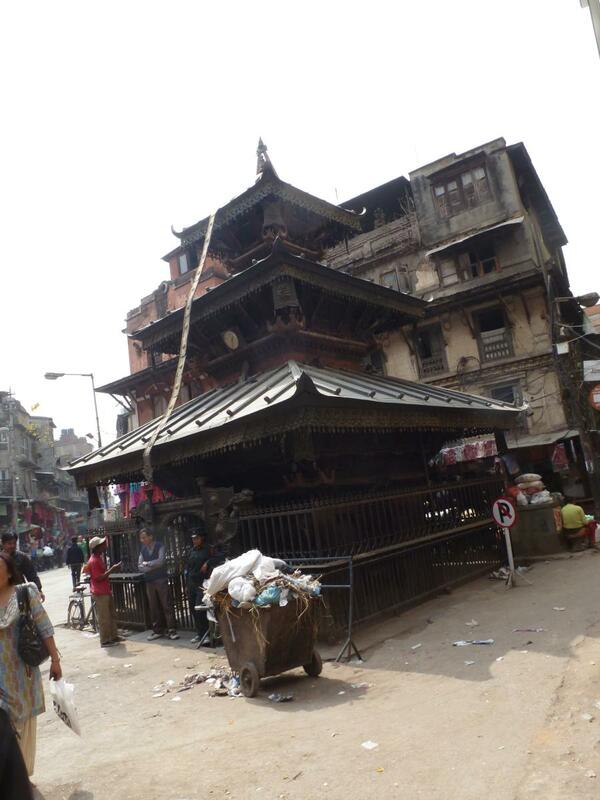 This past year my husband and I were back in Nepal to be with his family after his mother died suddenly. There were no words in English or Nepali to communicate my husband’s family’s loss. Like I learned with TS, just being there with them, grieving in person, showing them I cared was all I could do. Four months ago, on the day of the one year puja for Mamu, the priest tied red doro strings around our wrists in blessing. A similar red string is tied on during Indra Jatra, a festival in late summer, and cut off of the wrist and tied to the tail of a cow during Tihar. You only wear the Indra Jatra string for a few months, but I wasn’t sure how long we were supposed to wear these ones. 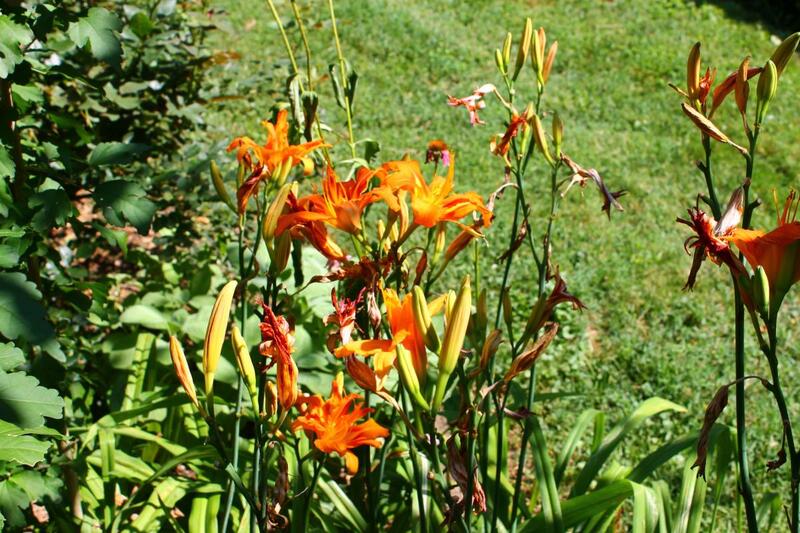 “I guess until they get frayed and lose their color,” Tri told me when I asked him. Finally, yesterday, my sting fell off. It just kind of unwound and came apart, and I started to reflect on the last four months that I’ve been wearing it. When mamu died and I first became aware of the Hindu mourning process, I was shocked at how involved it is. 13 days of wearing white, eating only one meal a day, and seeing visitors all day long. 45 days of no meat. 1 year of no celebrations. All of that was such a contrast to the Western tradition with its one day of mourning, but I accepted it because I had to. Overtime I felt that the mourning period had its upsides, and I think we found solace in it. Somehow, though, I thought we would be released at the end of one year. Like we had punished ourselves enough, we’d put in our time and could clock out and move on but it hasn’t been that easy. 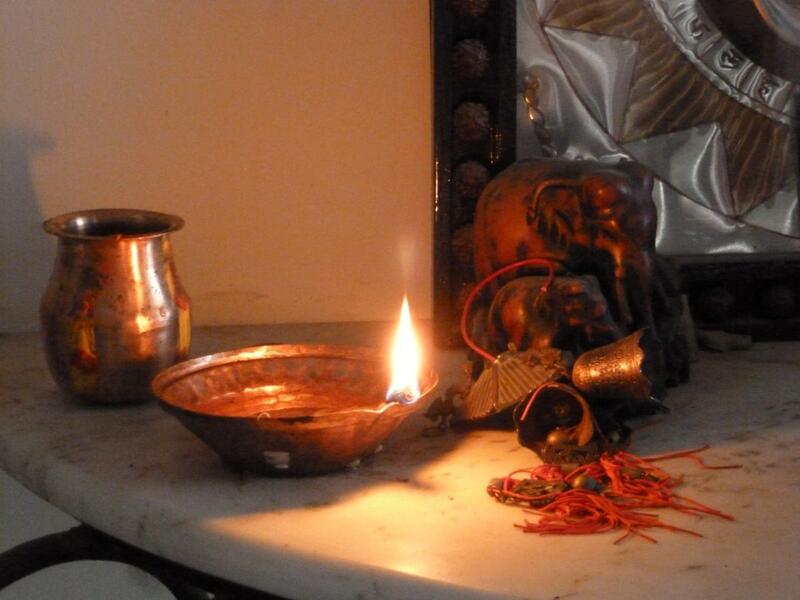 I remember during the one year puja for Mamu’s death, I felt a huge sense of relief. Getting the tikka and blessing from the priest after the hours-long ceremony made me feel like I could join the world again. But as the months have passed since that day in April, things haven’t felt all that different. Overtime, the sad feelings and shock have ebbed, but our grief is still palpaple. For both Mamu and for my grandmother. I was looking at a pair of earings I wear that my grandmother gave me, and I just burst into tears thinking about her. I really miss her. I grieve for Mamu in a different way. I grieve for the person she was and the person I knew, but I didn’t know her for that long. Mostly, I’ve grieved through Tri and his family and for what I imagine our relationship might have grown into. I just read this great book called Wild. It’s a memoir written by a woman named Cheryl Strayed who hiked the Pacific Crest Trail a few years after her mom died. After she experiences the heart-wrenching, premature death of her mother, she goes way out of wack, cheats on her husband, does heroin. Spending three months hiking helps her to bring her life back into focus. I loved the author’s voice and the stories she had to tell, but by the end of the book, I felt a false sense that everything had been fixed. 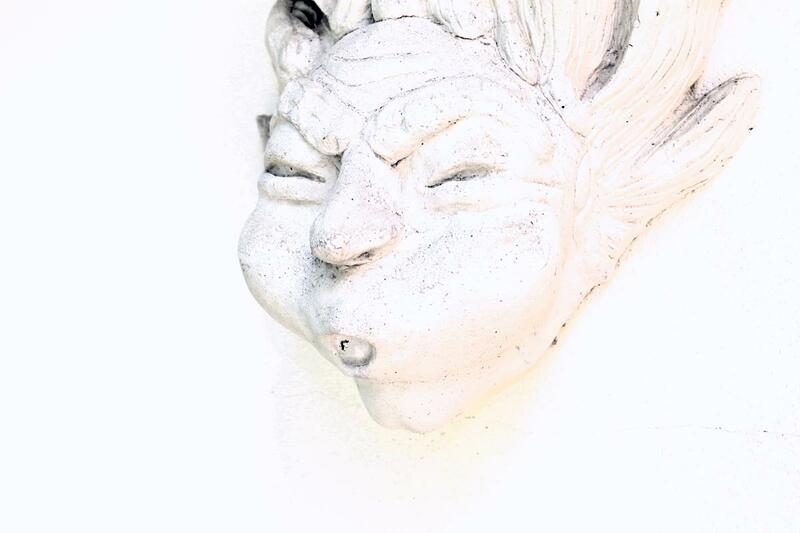 It’s tempting to believe that doing something crazy or intense will cure all of our troubles. 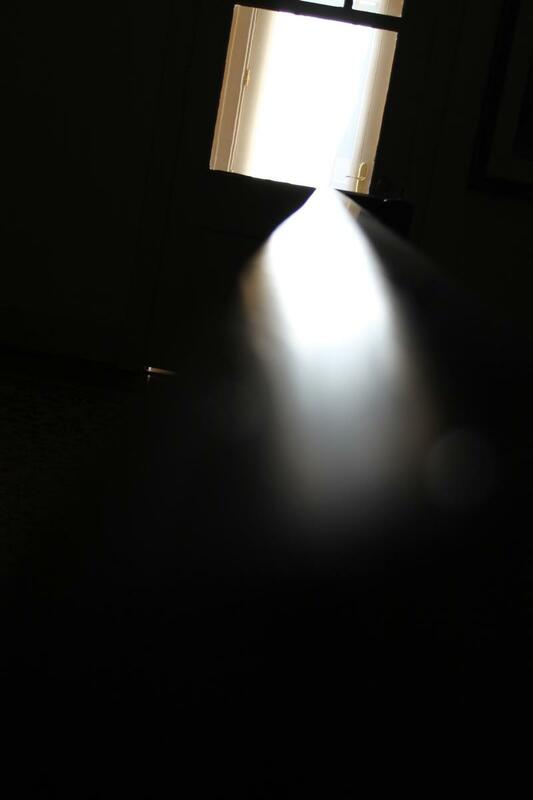 From what she writes, the journey seems to have re-centered her, removed her far enough from the infidelities and drugs so that she could move past them, but I doubt that she stopped grieving afterwards. I guess what I’m trying to say is that I thought that having the one year period to grieve would give us a way to fast track our grief and move on and be okay. Part of me desparetely wants to forget about everything so that we can live our lives. But really, I don’t think there’s anything that can dull the pain and confusion and anger of death except maybe time. We just have to grieve until we’re ready to be done. Tri booked the earliest flight that he could and left for the airport alone. I kissed him goodbye, not knowing exactly what was going on, not knowing how long he’d be there, not knowing when I get to see him again. The next few days were lonely as hell for me. I felt lost and confused. I knew he would reach Nepal by Tuesday night while I was sleeping, and I was hoping that I would get news letting me know that he had made it to his family safely. When I woke up on Wednesday morning, groggy from a restless night, I checked my mail to find something from Tri’s friend: Tri had made it to Nepal, had his seen his mom one last time before the ventilator was turned off, and now she was dead. Those few days of being alone and unsure and then the shock of finding out that Tri’s mom was dead were the worst days of my life, and I hope that as long as I live, I’ll never have to experience something so heart-wrenching. Tri, his dad and his brother went immediately into the initial 13-day mourning period required of Hindus, but the next year was also part of that mourning process. This past year we’ve been considered jutho (discussed here and here), unable to partake in religious holidays, weddings, or pujas, except for the monthly shradda. Last week was the puja to mark the end of the year long period. It was a strange experience, both sad and uplifting, a big fat reminder of the nightmare that happened a year ago but also a time to enjoy family and friends. On the first day, the family priest came to our house and performed the usual shradda that has been happening every month. Tri and his brother fasted in the morning and participated in the puja. The next day, a similar puja took place at the house. 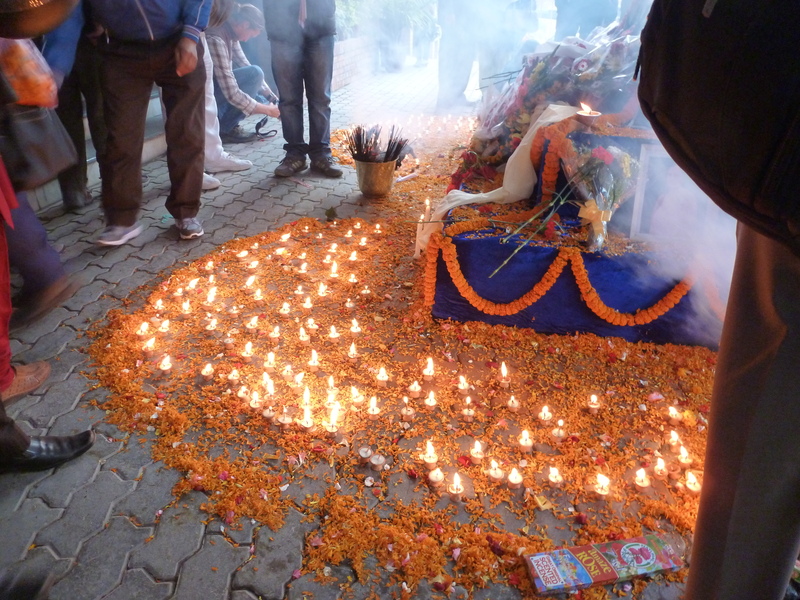 Normally we would have gotten visitors for this puja, but there was a bandha in Kathmandu that day, so only a few people living close by could make it. The third day was the big puja. Eleven priests came to our house. They were required to recite the Mahabharat, a Hindu epic, but because it’s so long, each priest read a part of it so that the whole thing could be finished that day. 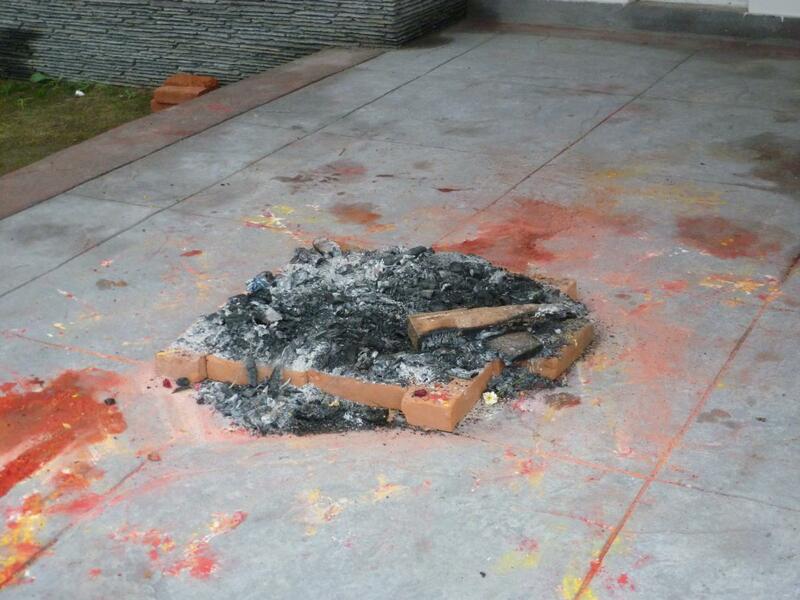 A picture of Mamu was set in the middle of the puja area, and a fire was lit. Tri, his brother, and his dad were called over by the priests periodically to sit near them and perform certain rituals. I don’t know the meaning behind most of what was going on, but there were a lot of fruits, flowers, and water involved, and one of the priests kept pouring ghyu (clarified butter) into the fire. This went on from morning into mid afternoon, all the while the fire burning strong. Towards the end, one of the priests went onto the balcony on the second floor of the house and unrolled a red cloth. Buwa grabbed onto it and then Tri, his brother, his dad, his aunt, and I all got under it as the priest poured water along the cloth and onto our heads. I assume it has something to do with purification. 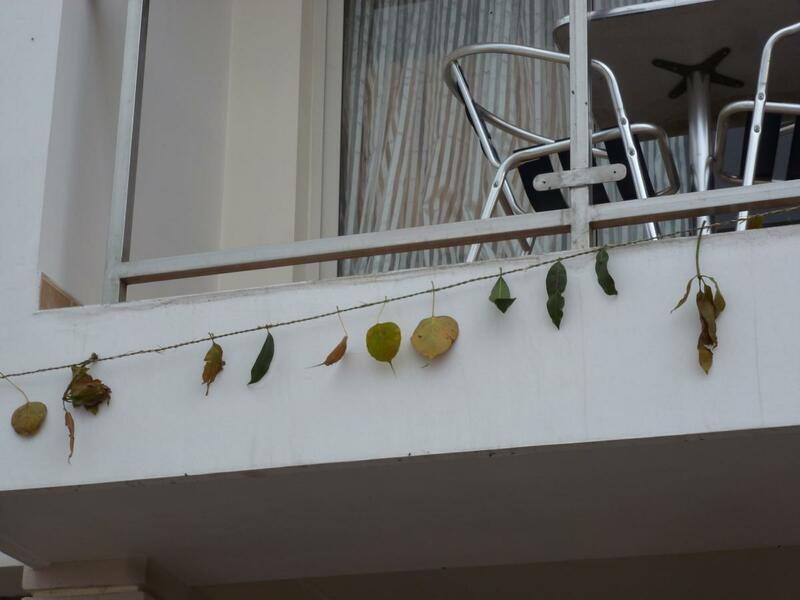 Then a long string of dried leaves was hung across our house to keep the ghosts and bad spirits away. This was actually supposed to be hung up after we moved into our new house, but since we weren’t allow to then because we were jutho, the priest included it in this puja. 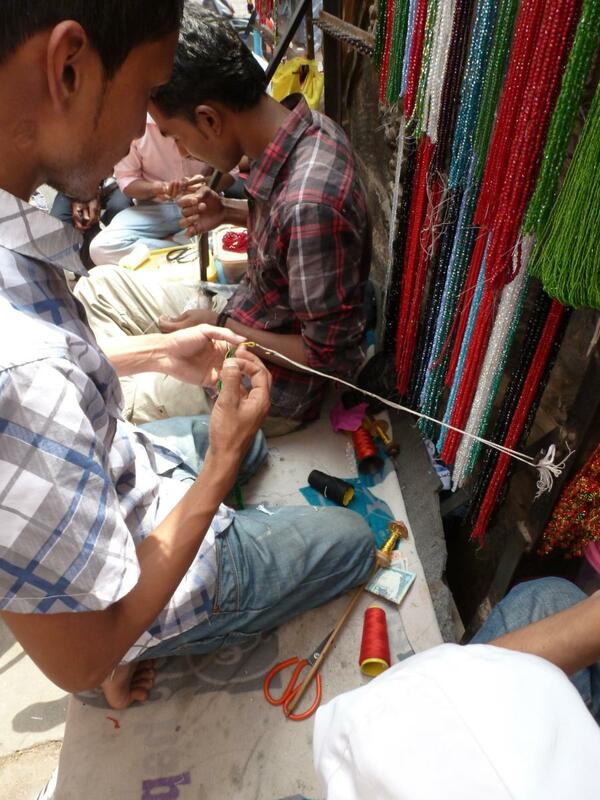 Afterwards, the priests blessed us with tikka (our first in a year) and then tied red doro strings around our wrists. Towards the afternoon, people started showing up, hanging around to watch the puja, and after everything was over, we all ate a big meal. Many people came by: neighbors, distant relatives, close ones, friends. In the evening, as fewer guests remained, we all moved into the living room, and although there was sadness, things felt a little festive with people joking and laughing. Mostly, I just felt relief. It feels like we’ve been given the go-ahead to live again, to continue with our lives. Ironically, the first day of puja fell on Easter. Tri wasn’t supposed to eat meat or eggs that day, so no Easter Eggs for us, but despite the clash in traditions, the two somehow felt similar. I’m a secular Christian more than anything else. I’ve always celebrated Easter but never attached any religious meaning to it. However, I do recognized it as a holiday of death and rebirth. According to Hindu beliefs, Mamu might be out there somewhere, experiencing a rebirth of her own. For us, this ceremony was kind of a renewal and and permission to move onto the next chapter of our lives. Although we’ve been immobilized by grief and Hindu rules about mourning during this past year, I have to admit that this year has been filled with a lot of wonderful things too. I graduated from college; Tri and I got married. We learned a lot about each other and ourselves, and we moved across the world. I got to meet and know his family and friends better so that now they’re my family and friends too. Despite the still tangible grief, life is looking pretty good. I recognize what has happened in the past and won’t forget it, but I feel excited for the future. 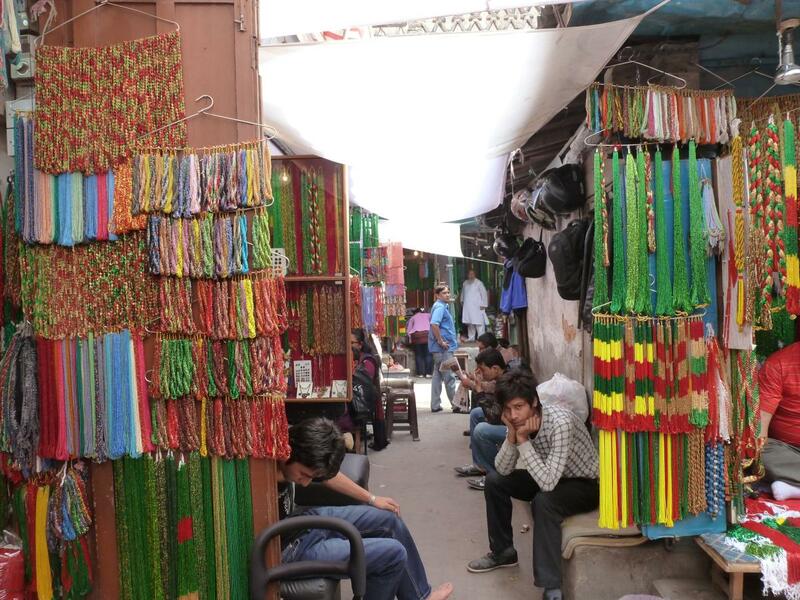 On Sunday we went to Ason Bazaar, a market in the heart of the city. 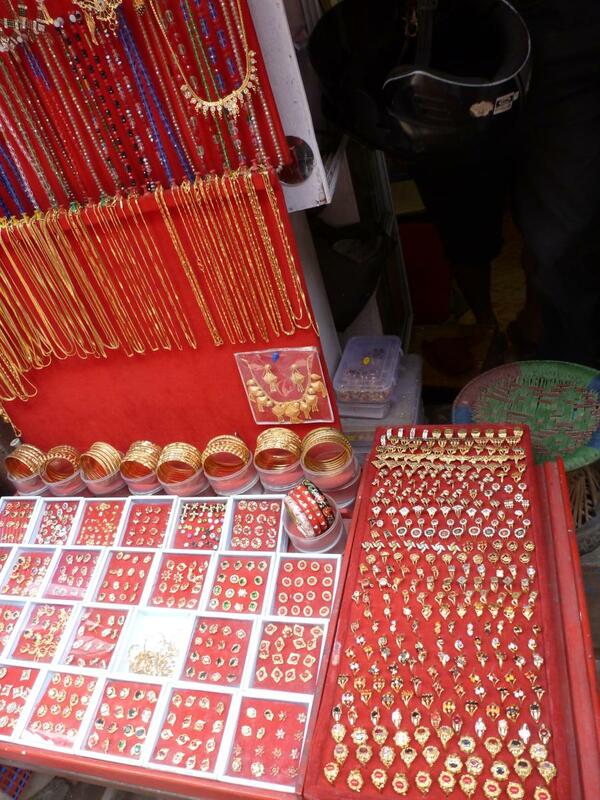 We went with Mama and Maijiu to begin buying things for the 1 year puja to mark Mamu’s death. I wrote about the Shradda ceremony a while ago in this post. It’s been happening every month for the last year, and during the puja that takes place, food is set out as an offering to Mamu. During the 1 year puja, the family needs to give offerings of clothing, jewelry, cookware, shoes, and other things that will supposedly reach her in heaven. I know that Tri was feeling a little bad about the whole thing because these items are quite expensive. After the ceremony, all of the items are given to the priest’s wife; we had to buy everything in her size. It’s a little difficult to swallow that a grieving family has to shell out so much money. If it was all donated to the poor, that might be one thing, but it’s going to the priest and his family. Some people are totally fine with this, and if they really believe that the items will reach their loved ones in heaven, then it certainly brings piece of mind. But for agnostics or nonbelievers I understand why it might make them feel uneasy. I enjoyed going out, though. If you’re going to visit Kathmandu, you’ve got to go to Ason. 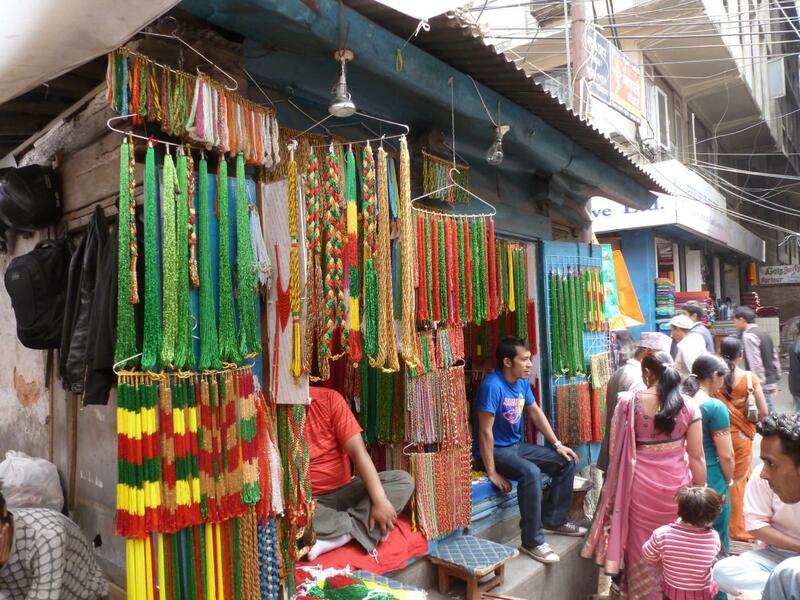 After walking for a while, we reached a tiny jewelry shop near Basantapur (a square with many temples in it). I literally had to crouch down to squeeze inside the shop. Mama and Maijiu bought a ring and a tilhari there before we headed over to the pote section of Ason. 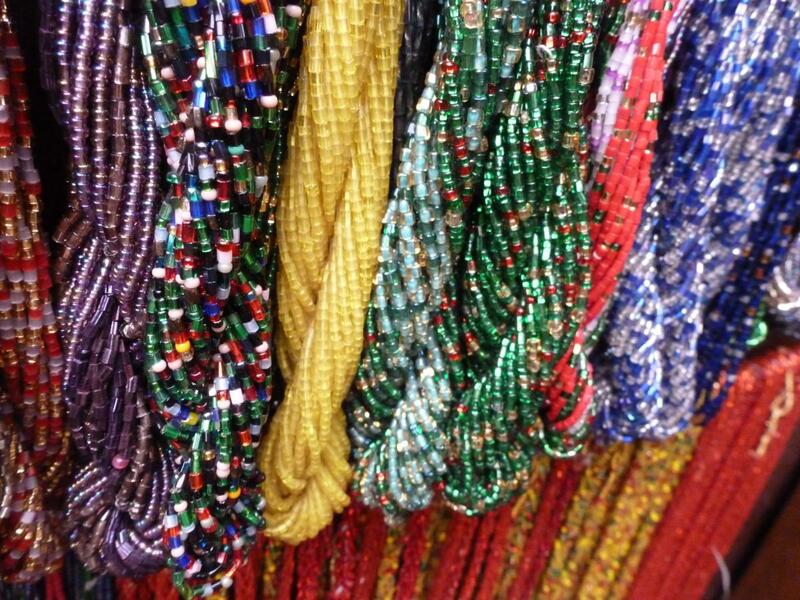 As I’ve mentioned before, pote are Nepali marriage beads. The tilhari that Mama and Maijiu bought is a big golden bead that is threaded onto the middle of the pote. After we brought the tilhari to a pote shop and Maijiu had picked out a good set of beads, the expert threader went to work. I sometimes wear pote. Recently I haven’t been doing it as much, but I do when the beads look good with the outfit I’m wearing. And since I only have one pote that I like, I thought I should get a couple more while we were in Ason. The one that I have already is a string of red beads with green beaded flowers around the necklace. 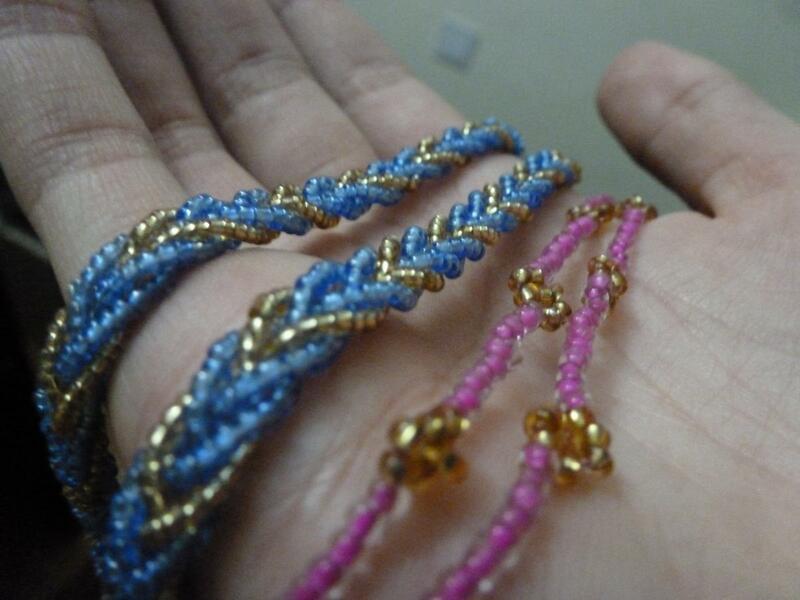 Yesterday I chose another thin string of pink beads with gold beaded flowers and a slightly thicker one made of blue and gold beads. I just took a light blue sari to the tailor to be sewn, and I’m hoping the blue pote goes well with the sari fabric. After our romp around Ason, I was tired and starving! 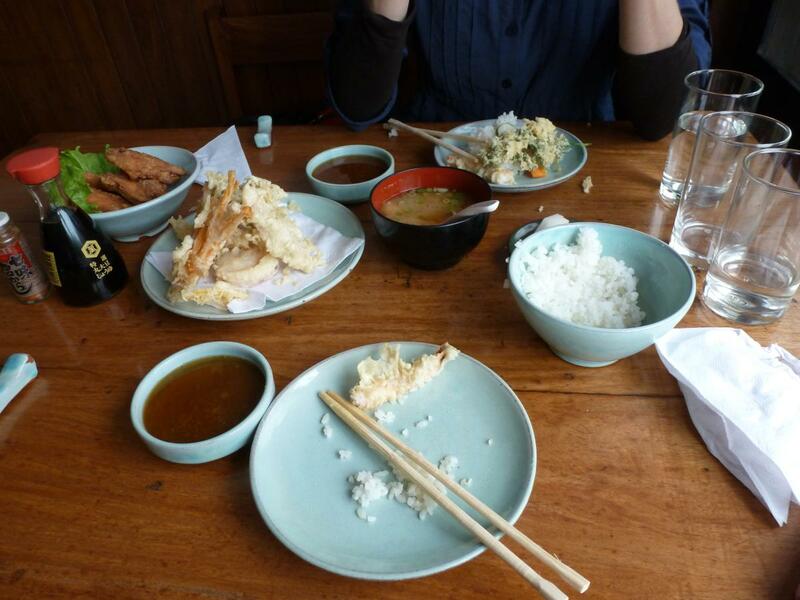 So Tri and I went to the only Japanese restaurant that I know of in Kathmandu, a place called Koto. It really hit the spot. It’s always difficult to wait, and lately it’s been wearing me down. One thing the we’re waiting for is the one year mark of Tri’s mom’s death. Last weekend was the shradda for the eleventh month, so the one year mark is only a few weeks away. I guess it’s sort of like the final funeral for Mamu. There’s going to be a priest, a puja, and family members and friends will be over at the house. We’ve been waiting for this day for the last eleven months, waiting for the mourning period to end, waiting for things to go on. As the year has inched by, things have progressively gotten better. Tri’s dad is definitely doing better, and so are Tri and his brother. Things feels less overwhelming and more normal. But as we move closer to this one year marker, I’m feeling more and more anxious. I just want it to be over with, and waiting has gotten under my skin. The other thing that we’re waiting for is more news about our return to the US. When we came here last summer, we weren’t really sure how long we’d stay. We knew we had to be here at least until the one year date of Mamu’s death, but beyond that, we had nothing telling us to stay or to go. We considered the possibility of settling in Nepal, but a few months after moving here, I decided I didn’t want to make Nepal our home base. There are so many amazing things about being in Nepal, but there have been some real challenges too. So a few months into our stay, Tri and I talked about when we wanted to go back. I knew that I wanted to start grad school in fall of 2013, but before that, we were free to be where we wanted. At first, we thought we’d stay here for a year; then we moved it to two years, then a year and half. We kept changing our minds. But now it seems like we’ll be going back sooner than we had planned. I won’t say more about it until I have more details, but our return to the US is definitely on the horizon. While I was looking at pictures, I felt a wave of longing to be back in the US. For the last eight months, I’ve been swallowing feelings about my family, kind of ignoring how much I miss them. I knew I wouldn’t see them for a long time, so I had put the idea of being with them out of my head. But once there was some indication that I’d get to see them sooner than I thought, I really started to miss them. So for now, I wait. When I have free time, I try to keep myself occupied. Reading, writing, a little bit of cooking, and yesterday I did a deep cleaning of our room, which definitely made me feel better! Tri completely changed the direction of my life. If I hadn’t had met him, I would likely never come to Nepal and never have learned to speak Nepali. I would never have realized my interested in Linguistics, probably would not have majored in that subject, and would never have thought about getting a masters in what I’m hoping to go to grad school for. My own habits and manerisms have been deeply affected by my husband and the time I’ve spent abroad. Without having met him I think I would be a very different person with a very different life. And this same goes for him. I know that I’ve changed the way he thinks and experiences things, his view and opinions, and goals. I don’t credit or blame him for every success and failure I’ve had, and I certainly am my own person, but he was one of the major catalysts that set my life going in the direction it has. I met Tri when I was 18, pretty young to meet your future spouse (although not out of the question), and we got married when I was 21, soon after college graduation last spring. The last year of our lives has been a whirlwind of activity and emotion, filled with a lot of sadness but excitement too. What happened during this time that led us to marry at a young age was a set of events that we could never have predicted. Everything started in the early spring of 2011. Tri and I had been dating for about 3 years at that point. Right from the beginning of our relationship, we knew that we were in it for the long haul. Everything just felt right with him and always has. I know that sounds horribly cliche, but it’s true. We had always talked about getting hitched sometime after my college graduation (he graduated two years before me), so last spring, we started talking to both of our parents about the possibility of getting engaged over the summer. We didn’t want to get married yet…we didn’t feel like there was any reason to, but we thought it would be nice to take the next step in our relationship. Both of our parents were very happy with this idea and supported our plan to have an engagement ceremony in Nepal. We all thought that an engagement in Nepal and then a wedding in the US a few years later sounded good. But then Nepali culture and the rules that go along with it kicked into high gear. In the process of planning for our wedding, Tri’s mom consulted an astrologer. He felt like it wouldn’t be appropriate for us to just have an engagement ceremony, that we needed to get married as well. In Nepal, people don’t often have long engagements. Usually they have a khura chine ceremony and then a wedding a few weeks (or sometimes days) later, so the astrologer felt it would be culturally inapropriate for us to have just an engagement ceremony. Tri’s mom started talking to us about the possibility of upgrading our engagement to a wedding. I think we were both a little bit in shock at this idea. Of course we had thought about marriage and wanted to be married someday, but it was strange to think it would be happening so soon. But after talking about it, the idea started warming up to us, and we agreed. That set the wedding planning in motion. Tri’s parents were choosing a location, compiling a guest list with hundreds of people, and doing lots of shopping. I was excited to be getting married but a little bit freaked out too. I was trying to finish up my last semester of college and frantically look for some kind of employment. Doing that on top of preparing to be married in a foreign country was a bit overwhelming. And then everything came to a horrible halt. Tri’s mom died suddenly in April, 2011. I don’t feel like going into the details of what happened because it’s still very painful to dwell on, but maybe later, when we’ve come to terms with her death a little better, I can write more about going through those initial days and weeks of grief. Everything was put on hold, the wedding, Tri’s job, our lives. Tri left for Nepal within 12 hours of getting the horrible phone call, and I felt stranded and alone. Getting through those last few weeks of my last semester of college was hell. But I do have to say, my friends and family were incredibly supportive and helpful. You know who you are! And I love you guys. About a month later, after the funeral and initial grieving period in Nepal were over, Tri came back to the US with a plan for us to return to Nepal to live with his brother and dad. I was incredibly supportive of his decision. 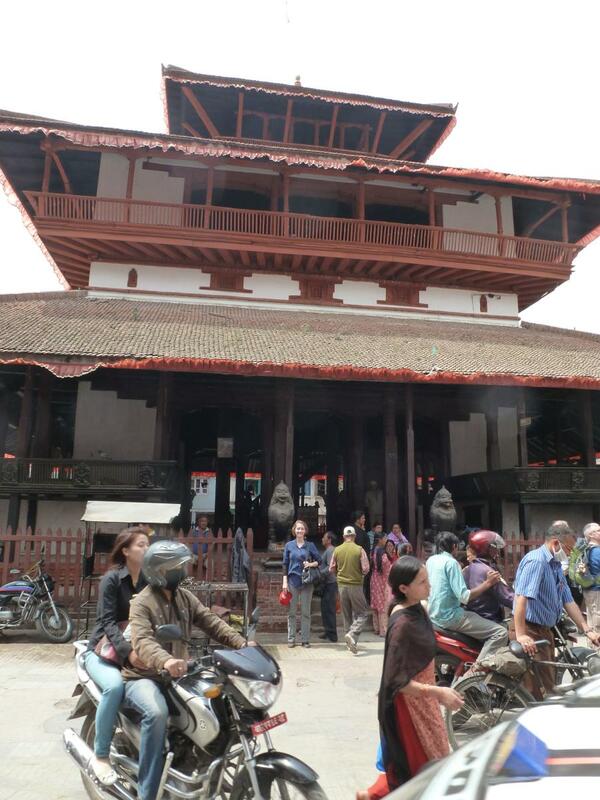 But in order for me to stay in Nepal for an extended period of time, I had to be married to Tri. 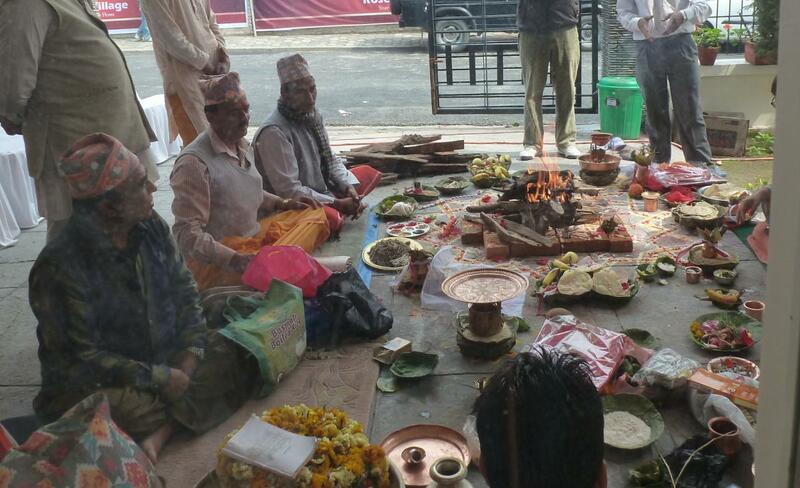 As I’ve mentioned before in this blog, Nepali Hindus believe that having any kind of celebration, doing puja, or going to weddings, etc. is not allowed the year after a family member dies, so us getting married was a bit of a problem. That’s why we decided to have the simplest wedding we could manage, nothing religious and without any bells and whistles. We had the mayor of our small town marry us at my folks’ house. Because it was such a small ceremony, we didn’t get an opportunity to celebrate with most of our family and friends, but we’re not going to leave them out. Tri and I are planning a wedding ceremony that will hopefully happen in about a year and a half…a topic for future posts. Anyway, some Nepali people were very against our marriage at the time because of breaking the one year rule, but we had no choice. We both felt that Tri needed to go back to Nepal, and there was no way that Tri and I were going to be separated. In the craziness of those few months and the aftermath of that period that included moving to a new country, lots of culture shock, and language learning, I haven’t really had the time and energy to process and understand the fact that I’m married and what that means for my life and relationship. It’s only now that I’m really starting to think about how my life has changed after marriage. Being in Nepal has definitely had a huge affect on those changes. In Tri’s parents’ generation, marrying young, even for educated women living in urban areas, was normal. Tri’s mom was 19 when she married his dad. Even now, women in rural areas marry young, sometimes as teenagers. But it is a bit unusual these days for a woman who comes from an urban, middle class family to be married at age 21. Because I’m mostly around people from urban, middle class families, I sometimes get surprised looks when I tell them I’m married. I think part of it is that some Nepalis have certain stereotypes about Western women, about them having many different partners and marrying very late, so I don’t fit into their stereotype. But it’s also that there has been a push in Nepal from NGO’s, social service organizations, and other influences for women to marry later. When I was in Dhampush, I made friends with another one of the girls on the trip who is about 27 and was married last year. We stayed in a lodge, and one day we started talking to the owner about her daughters. Like me, they married in their very early 20’s. My friend started scolding the lodge owner (in a friendly way), telling her that she should have made them wait, finish school, and then marry. But then my friend looked at me and remembered that I was 21 when I married too! We both laughed. Besides getting some funny looks and reactions from Nepalis about being married young, I’ve also received greater acceptance. Before getting married, I had some people tell me that life after marriage didn’t change their relationship with their signficant other one bit, and I’ve had others say it changed everything. I’ve found that the way that Tri and I treat each other hasn’t changed, but the way that others treat us has. This is particularly true in Nepal. Our relationship wasn’t really valid in the eyes of many Nepalis before we were married, and although Tri’s parents accepted our relationship, they were hesitant to tell others that Tri had a girlfriend. When I was in Nepal for study abroad, I stayed with Tri’s parents and brother for a week here and there, and they only revealed to their closest family and friends that I was Tri’s girlfriend. Being married has made our relationship in Nepal valid in the eyes of others, which is honestly a relief. Some say that that validation from others shouldn’t matter, and our love for eachother is definitely more important than what others think, but having that societal acceptance does make things easier. I’ve also found that women treat me differently. For some reason, I think being married has made other people, especially women, see me as more of an adult. They talk to me about more adults things and divulge secrets with me that I probably wouldn’t have been privy to before. Part of this may be the fact that I’m older. But I think it’s got something to do with being married. Before I got my license as a teenager, I decided to mark that I wanted to be an organ donor. My parents encouraged me to, and I have no religious or other objections that would prevent me from being one. Although it’s painful to consider the possibility that I might die, I know rationally that putting that little mark on my license could make a big difference in someone else’s life. Organ donation is widely promoted in the US, but it’s still rare in Nepal. However, after Mamu died, Buwa donated her eyes to the Tilganga Eye Centre. On Saturday, there was a ceremony to honor people who have given their eyes after death, and since Mamu donated her eyes, we went to attend the event. There were quite a few people in the crowd, which is a fantastic sign. To get that many people interested in and supporting organ donation is a great thing. Outside of the hospital, they built a display with flowers that listed all of the deceased donors’ names, and as part of the ceremony, family members of the dead lit incense and candles around the display. Some families got to meet the recipients of their love ones’ eyes: we didn’t, however, because the children who received Mamu’s eyes are very young, but the doctor who operated on these kids told us that he’ll introduce us to them in a few years. Tilganga Eye Centre is a really incredible place that works to treat patients from all walks of life. One of the people who drives the work there is a man named Doctor Sanduk Ruit. He’s a fantastic eye surgeon who has traveled all around Nepal to perform cataract surgery on people living in rural areas. He’s also done a great job of increasing publicity for the hospital. One way he’s successfully brought attention to the centre is by making connections with well-known people who become brand ambassadors for Tilganga. Recently he made a connection with the actor Joel Edgerton who was able to make it to Nepal and come to the event on Saturday. Joel’s most recent film is called Warrior, which Tri and I saw a few weeks ago. I can’t watch fight films to easily (I cringe when somebody gets hurt), so I was in and out of the room while Tri was watching, but Tri sat through it from start to finish and really enjoyed it. Here‘s and article about his trip to Nepal and Tilganga. He’s a super easy going, down to earth kind of guy, and I’m really excited for Tilganga because I think his support will help them increase other support to the hospital from abroad. Besides attrracting actors, Tilganga also attracts world-class doctors, often those who want to make a difference in the lives of Nepali people or who want to give back somehow. One such doctor is a well-known lasik eye surgeon based in both the US and the UK. I first got glasses in the third grade and then switched over to contacts in seventh, but I’ve never felt comfortable with either of my two options. Glasses feel heavy on my face, and contacts are unwearable past 8 or 9pm for me. I’ve wanted to have lasik eye surgery done, but I my eyes may continue to change in my twenties, so I’m wary of doing the procedure right now. However, Buwa thinks that if I do decide to have the surgery done, I might be able to get it done with this doctor. 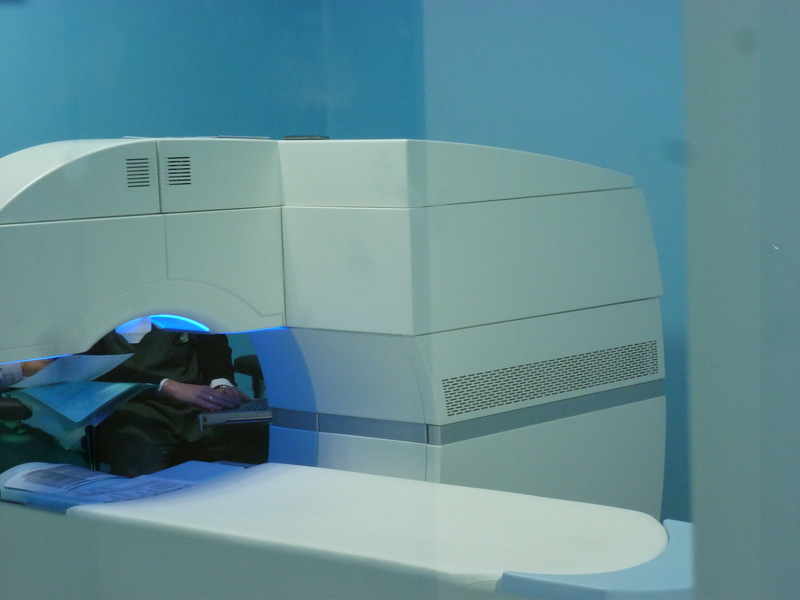 Besides having a fantastic doctor, Tilganga also has great equipment made by the German company Zeiss. If I have eye surgery done in the US, I’d probably have it performed at an average place with an average doctor for a couple thousand dollars to do one eye. For both eyes, the price could rise above $4000 dollars, but if I do it here, I might be able to get it done by this great surgeon with great equipment for a few hundred dollars. I’m finding this idea hard to resist. My mom is pretty against me doing it Nepal, but maybe I can convince her that it will be okay. There’s lots of time for me to decide anyway, so I’ll do some research and keep thinking about it.